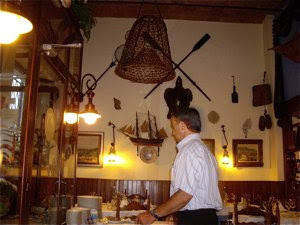 La Nansa was the second restaurant recommended by the locals in Sitges. This is a restaurant that remains open during the whole year. La Nansa is place to visit, even though the bill at the end of meal is higher than at other restaurants in the city, you get superior quality food. You should make a reservation, though, as La Nansa has been discovered by many of the tourists that visit this beautiful city by the Mediterranean. La Nansa is located in Carreta 24, a small charming street in the old part of Sitges, very easy to get to, if staying in the town. If you are visiting from Barcelona, you just have to walk for 15 minutes from the railway station. You will find brilliant service at La Nansa from start to the end of the experience. 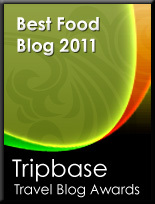 The staff was very kind and welcoming, gives excellent advice on food and drink. The food was served within reasonable time and what food!!! 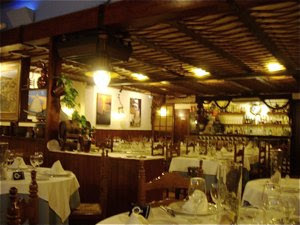 La Nansa has a rustic and very charming interior with white walls and dark wooden panels. A large number of different objects on the walls, without being too kitchy and out of taste. There were a relatively large number of tables, and the restaurant may, when fully booked feel rather over crowded. We did however not experience this as as we dined earlier than most Spaniards. The tables were elegantly set with wine glasses, cutlery, and napkins. I have eaten enough fried squid in my time to recognize a well prepared portion of this delicacy. Often you find that it is covered in too much batter and that it is too greasy. No such thing at La Nansa. Less is more. 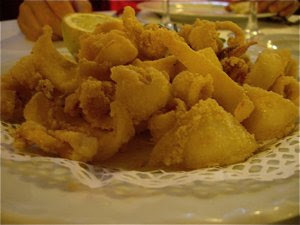 The squid was elegantly presented on a white paper napkin on a white plate with only half a lemon to squeeze over it. Well seasoned, crunchy outside and tender on the inside. This is how good seafood should taste like. This is one of these dishes that sounds like pure culinary indecency and is just that. I think the veal tenderloin was the best and most wicked dish I have eaten in a long time. Presented on a simple white dish, one decent sized piece of meat topped with a slice of goose liver and immersed in creamy mahogany coloured sauce, served with dauphinoise potatoes. The beef was served medium rare and tender until perfection. 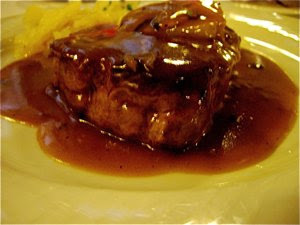 The foie gras had nearly melted by the heat of the sauce. The potatoes was tender with that little crunch. Perfectly balanced - you were nearly knocked out by the pungent truffle and foie gras aromas. Another definite winner. There is nothing better than to end with a sorbet. 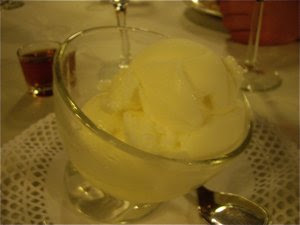 This fresh sorbet had the sweet and bitter aromas of its ingredients. It had an additional undefineable taste, and I found that the cook had boosted the alcohol level with a little Spanish brandy. The sorbet was a knock-out experience in more than one way. We ordered a Spanish red wine, a perfect choice for the dinner. My favourite in Sitges. A five-star experience at a very decent price. Book a table and enjoy a terrific meal. 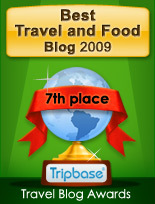 Enjoy Food & Travel highly recommend La Nansa and will certainly return for another meal the coming summer. 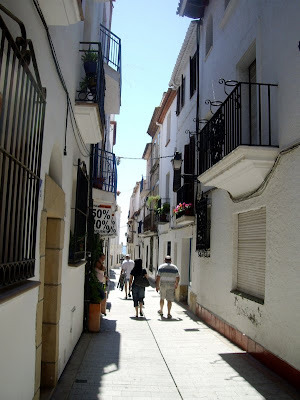 Do you want to know more about Sitges?